Farming in Saskatchewan has been a vital industry for many years. Because of the many safety hazards associated with farming, it is important to understand and implement farm safety plans to help avoid injury and potentially fatal accidents.
" Too many farmers, family members, and farm works are killed and injured on the farm each year as a result of incidents that could have been prevented" (Government of Saskatchewan, 2018). Northern Strands is committed to providing farmers with a cost effective and simple solution to help prevent falls while climbing or accessing grain bins. The Bin Safe System allows farmers to climb a grain bin with ease; knowing that they are secured allows workers to feel comfortable while working on the outside of the bin. The team at Northern Strands has developed a Ladder Safety Checklist to be used in conjunction with a Farm Safety Plan Template. This Ladder Safety Checklist can be referenced prior to climbing grain bins. Farm Safety Plan Templates are provided by a variety of Safety Associations for farmers to use for free. 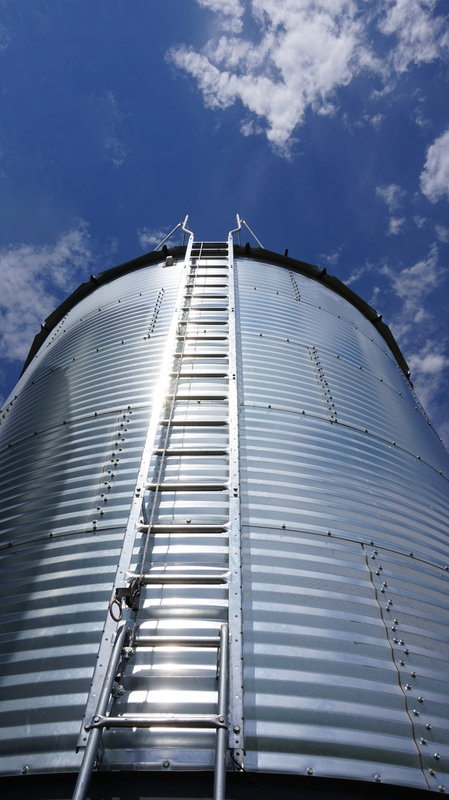 A Farm Safety Plan Template should be all encompassing and should include a grain bin fall protection section to ensure all potential farm safety hazards are identified. These Farm Safety Plan Templates can be used as a step in the development of your Farm Safety Program. Contact our Bin Safe System Representative to order or request additional information!